VAC AERO International is a global leader in Furnace Manufacturing, Vacuum Processing and Coating technologies. With five plants in Ontario and Quebec, Canada, VAC AERO’s global high-response service and support teams are always on call to provide direct assistance and expert advice to our clients around the world. VAC AERO’s Head Office is situated in Burlington, Ontario, Canada. 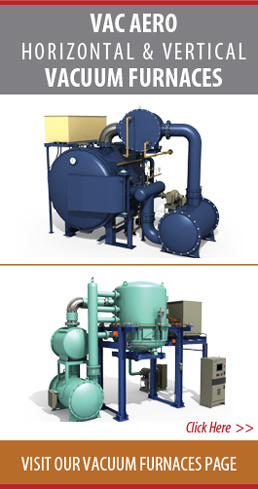 VAC AERO’s Thermal Processing Divisions: Plant 1 and Plant 2 are located in Oakville, Ontario, just west of Toronto. The Furnace Manufacturing division: Plant 3 is located in Burlington, Ontario, Canada. The Quebec Division is situated in the heart of Quebec’s aerospace community with the Ville St Laurent plant providing Thermal Processing services and the Boucherville Plant providing Coating services. VAC AERO is represented by Manufacturing Agents in North America, Europe and Asia. Currently, the combined VAC AERO operations are comprised of 150 employees, including more than 30 engineers and technologists.